We have acquired a small quantity of hat, cuff or shell jacket size GAR button covers and are offering them here priced by the piece for the button collector who would enjoy a single example or for the, Civil War or GAR enthusiast who would like to put a set together for wearing. These are the Fox Pat. 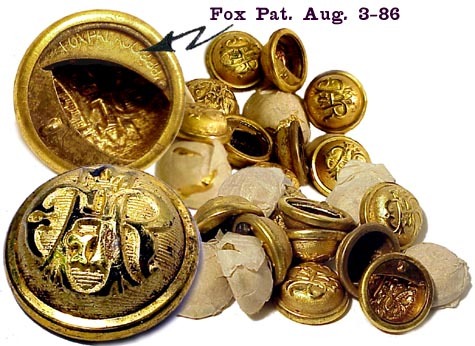 Aug. 3, 1886 marked button covers, die struck from brass with crisp gold gilding. Designed to slip over standard shirt size buttons the Fox Patent button cover sports a sliding closure on the back to secure each in place for permanent use or to temporarily upgrade the gentleman’s shirt , vest or short jacket for a special Grand Army of the Republic function. These covers are original and in "out of the box" condition with some even retaining the original 19th century tissue wrapper. please note: ALL ITEMS ARE CURRENT & AVAILABLE UNLESS MARKED SOLD!!. If you are new to our catalog and wish additional information or just to learn who we are, please check out our home page. Thanks for visiting our catalog! !